Gryff has finished Top 30 in the Dogzonline Point Score 2005 for the Northern Territory!! Fantastic considering he was only shown very sparingly and spent 5 months away from the show scene "holidaying" in Victoria. Gryff has certainly done well on the Darwin show circuit. In 2004 he won multiple Puppy In Group ribbons, with the most sought after being Puppy in Group at Darwin Royal 2004 under Ms G. Acreman (VIC). *Best in Group, Junior in Group, BEST IN SHOW and JUNIOR IN SHOW under Ms J. Perry (Thailand) on 5/2/05. *Best in Group and Intermediate in Group under Mr K. Iggleden (Q) at the D.A.B.K.C. Champ Show 2/4/05. In 2006, Gryff was shown very infrequently. He won four Best in Groups, five Intermediate in Group and one Best In Show. He is also the sire of Ch Estrik Steffi's second litter. At the 2006 Darwin Royal he was awarded Best of Breed and Intermediate in Group under Mr John Rowles (NSW). He is much loved by Willow (Estrik Yolanda), Sherrida and Eric ( as well as Mary and Ilona). 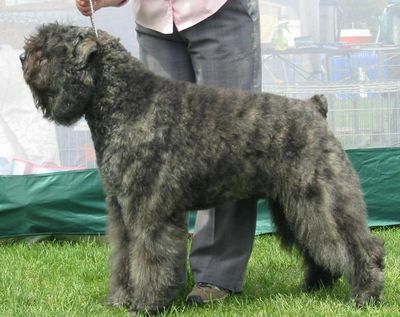 He is a Bouvier that has many fantastic breed attributes which have been recognised by judges from all over the world. As he matures he will no doubt impress many more!! Watch this space.